There is a show on the Cooking Channel that I watch called Serious Eats and they were at a restaurant in LA and were featuring a vegetarian burger (not sure if it was vegan) on their menu called The Earth Burger. 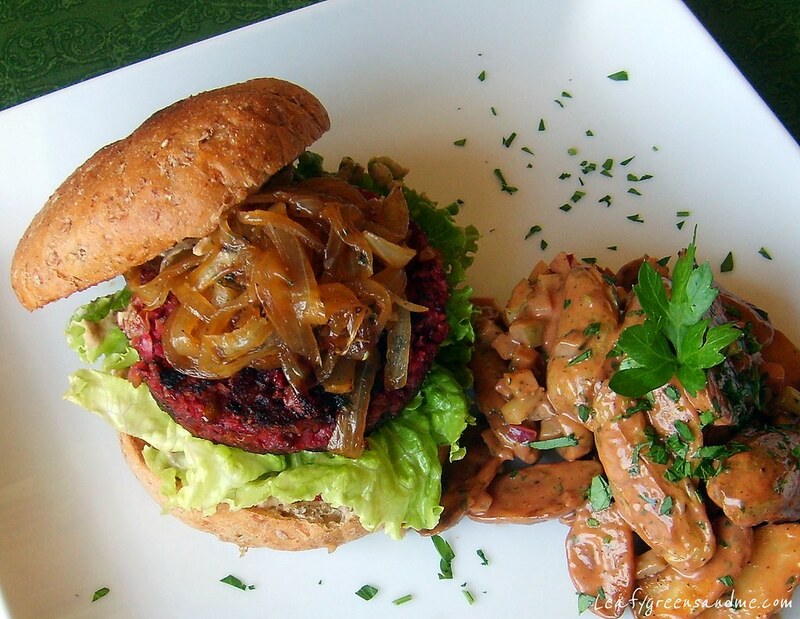 The burger was made with edamame, beets and mushrooms and it sounded very interesting to me and so I decided to give it a try and see if I could come up with my own version. My biggest pet peeve about making vegan burgers whether they are made with black beans, lentils, barley, textured soy protein, or a combination thereof is that they have a tendency to fall apart or get squishy while eating them. I added gluten to my recipe, as well as bread crumbs, and so they hold up fairly well. But this is a small price to pay because the alternative is a formed, pressed and freeze-dried patty located in the frozen section of your super market...and who wants to eat that! I served my burgers with Madeira Caramelized Onions and Porcini Aioli, and a side of BBQ'd Roasted Fingerling Potato Salad. Note: For the beet pulp, I have a juicer and so I just scrub the beet really well and then place in the juicer. The juicer minces the beet into pulp and also gives me juice. If you don't have a juicer, just grate the beet on a box grater in a bowl to get the beet pulp and juice. Place a 1/2 cup short grain brown rice and a 1/2 tsp kosher salt in a sauce pan and cover with plenty of water. Bring to a boil, reduce to a simmer and cook until rice is soft, about 40 minutes. Drain rice really well and press any remaining moisture out of the rice with the back of a spoon. Set aside. In a large saute plan heat 1 tbsp canola oil on medium-high and add sliced mushrooms. Cook mushrooms for about 5 minutes until caramelized and golden brown. Turn heat down to medium-low and add onions, beet pulp, garlic, thyme and cook until onions are soft. Deglaze with Madeira, and white wine and add beet juice, porcini powder, smoked paprika and cook until all liquid is absorbed about 20 minutes, stirring frequently to prevent burning. Let mushroom mixture cool to room temperature for about 15 minutes and then stir in brown rice. Add mixture to a food processor, along with edamame, miso paste, BBQ sauce and pulse about 10 times until combined. Do not pulse it into a paste or puree, you want it to have texture. Scrape mixture into a bowl and stir in bread crumbs until combined and then the wheat gluten. Season with salt and pepper to taste and then form into patties. To form the patties, I use a 1/3 cup measuring cup and a round cookie ring about the size of my burger buns. I scoop the mixture into the measuring cup and then spoon it into the ring and then press the mixture lightly with the bottom of a plastic squeeze bottle to form a compact patty. I then remove the ring and repeat. The patties are about 1/3-1/2 inch thick each. Chill patties for about 1-2 hours for flavors to combine. To cook, heat a cast-iron skillet on medium heat and add a little canola oil. Brush patties with a little BBQ sauce on both sides, and sprinkle with salt and pepper. Cook patties about 3-4 minutes on each side until heated through and golden brown. Heat a large saute pan on medium heat, add olive oil and sliced onions and cook until caramelized, about 15 minutes. Add thyme, garlic and deglaze with Madeira wine and cook until all liquid is absorbed and onions are creamy in texture. Season with salt and pepper and keep warm. Mix all ingredients together in a bowl and chill for about an hour for flavors to combine.